The 11 March 2011 Great East Japan Earthquake affected dozens of coastal communities along the shore of Japan’s Tohoku region. Following the earthquake, tsunami and nuclear meltdowns, utilities, businesses and schools in some towns have bounced back to pre-disaster capacity while other municipalities have lagged behind. The question of which factors accelerate the recovery of business, infrastructure and population after the disaster remains unanswered. 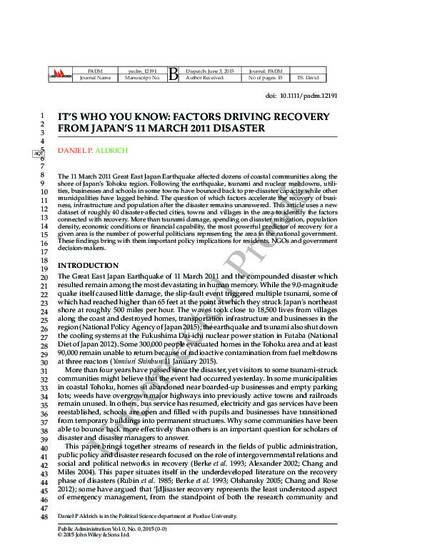 This article uses a new dataset of roughly 40 disaster-affected cities, towns and villages in the area to identify the factors connected with recovery. More than tsunami damage, spending on disaster mitigation, population density, economic conditions or financial capability, the most powerful predictor of recovery for a given area is the number of powerful politicians representing the area in the national government. These findings bring with them important policy implications for residents, NGOs and government decision-makers.